The end was inevitable. 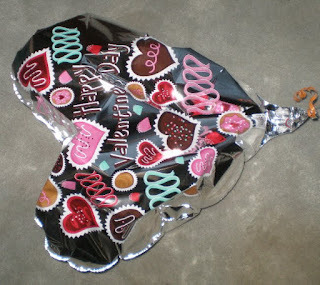 There it is, lying quietly on the carpet, the deflated Valentine's Day balloon. I paid less than $10 for this at the grocery store on February 13. It floated proudly for weeks, cheerfully displaying its shiny message every day. It took nearly three months for it to gradually sink to the floor. Despite its fall from grace, it is a reminder that you don't always have to spend a lot of money to make a big impression. But today is trash day, time to let the balloon go.